What's Up With All These Giant Smartphones? The “phablet” phenomenon is taking the mobile world by storm.Manufacturers at the world’s biggest mobile fair in Barcelona, Spain released a slew of outsized smartphones that can barely fit in one hand and tablets that have shrunk dramatically. Further blurring the lines between smartphone and tablet, a selection of the latest tablets can be used as phones, albeit somewhat awkwardly. At the February 25-28 World Mobile Congress, the Ascend Mate by Chinese manufacturer Huawei, the world’s number three smartphone manufacturer, was the champion with a vast six-inch screen. Not far behind in the smartphone screen real estate contest, rival Chinese handset maker ZTE released its Grand Memo boasting a 5.7-inch display. South Korean giant LG trailed with its Optimus Pro, at 5.5 inches. “It’s a growing trend, especially in Asia, and a lot of these phones are favoured by women, women who don’t have to worry putting it into their pockets, they carry it in their purse,” said Ken Hong, communications director at LG. More than 120 million tablets were sold worldwide in 2012, up 50 per cent from the previous year, and shipments of smartphones are predicted to hit one billion this year according to global consultants Deloitte. But the size of tablets is shrinking. The Samsung Galaxy Note 8, released just ahead of the congress, trimmed its screen to eight inches to compete with Apple’s new iPad mini. Taiwan’s Asus has managed to marry the two devices. 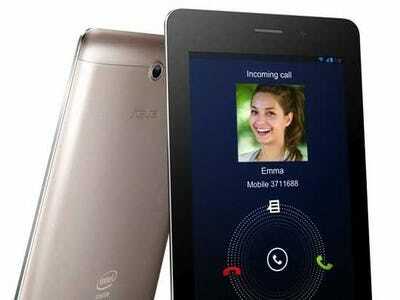 Asus showed off the Padfone Infinity, a five-inch, high-definition screen smartphone that can harness the latest superfast fourth-generation wireless network and which slots into 10.1-inch tablet. The smartphones of 2013 have to be fast, too, however, as the 4G network, also known as Long Term Evolution, or LTE, expands worldwide. China’s Huawei unveiled a new mobile at the show, the Ascend P2, which it claims is the fastest in the world. Sharp-cornered and thinner than a pencil at 8.4 mm, the company said it can achieve speeds of 150 Mbps, fast enough to download a two-hour high-definition movie in less than five minutes. The mobile, which has a more modest 4.7-inch, high definition screen, is powered by a 1.5 GHz quad-core processor and is able to use LTE networks. Huawei held 5.3 per cent of the market in the fourth quarter of 2012. That is still well behind Samsung and Apple which held more than 50 per cent of the sales combined — 29.0 per cent for Samsung and 22.1 per cent for Apple. If you can’t be the biggest, smallest or fastest, there is another way to the hearts of mobile phone consumers. Finnish manufacturer Nokia, once the leader of the mobile phone world, tried to lure shoppers with lower prices. Nokia released two Windows Phone-operated smartphones — the Lumia 520 and 720 — to be offered with pre-tax price tags of 139 euros ($189) and 249 euros respectively. But Nokia also offered the Nokia 105, the kind of mobile handset people use mostly for making telephone calls, for just 15 euros.